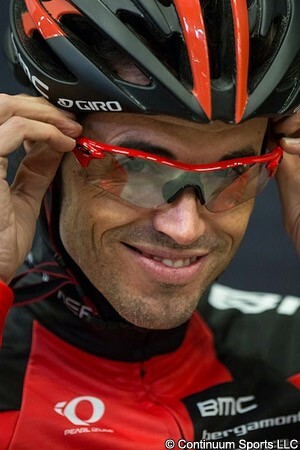 Riding the Giro d’Italia in support of team leader Cadel Evans and aiming to add a stage win to his previous victories on legs of the Tour de France and Vuelta a España, Samuel Sanchez and the BMC Racing Team have agreed his likely schedule for the foreseeable future. The Spaniard joined the team earlier this month, bringing to an end his long search for a slot after the Euskaltel Euskadi team stopped due to a lack of sponsors. Now the American squad has made clear that the Spaniard will have important responsibilities, although it envisages him as a domestique de luxe rather than a leader in the next four months. Before then, he will make his debut on March 1st in the Classic Sud Ardèche and then will compete the following day in the Drôme Classic. The two French events will be followed by Strade Bianche on March 8th and then Roma Maxima. He said the events would give him confidence and also enable him to see how the team functions. He also took the overall classification in the latter in 2012 and would seize the chance to do so again if things work out in that regard. It is not yet clear if Sanchez might ride the Tour de France. A decision on that would likely be taken after the Giro d’Italia.